I’ve got a free gift for you. I’m going to talk about it at the end of this video, but in the meantime — I crack myself up. I’m Erik Contzius from Make Tech Better, Incorporated: A Human Touch in a Silicon World. A lot of people come up to me and say, “Hey, Erik” — for some reason they sound like standup comedians — “Hey, Erik, I need a website.” And my first question to them is, “Why?” A lot of people, they want a website, but what they really want is a brochure, because they feel like, “Well, everybody else has a website, so shouldn’t I?” People really have to think about their marketing goals. Most people don’t even consider that. I’m the first person to raise the question. I don’t like turning away business, mind you. I want people to understand that what they’re getting will only serve their goals if they think about what are they trying to do? Are they trying to get a message out about a new thing, a new product or service? Are they trying to get more business? Are they trying to sell something? Or are they trying to just get a message out to the world, “Hey, I’m here”? They have to think about that before we can make the vehicle that’s going to get that out there. Think about this: you’ve got a bunch of bunnies, and they need to get out to the farm. How are you going to get them out there? Are you going to put them on your backpack or are you going to put them in your pickup truck? There are different ways to get those bunnies out there. Why bunnies? I don’t know. Just thought I’d go with it. Think about your goals before you make something. Now, I told you about something free I want to give you; here it is. 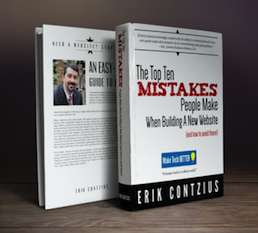 Down below, there are instructions to get my free e-book, The Top Ten Mistakes People Make When Building a Website and How to Avoid Them. Just follow those directions below, and you’ll get that. I’m Erik Contzius, Make Tech Better. Look out for bunnies.